In the group of periodic table, namely, Group 15 comprising of nitrogen, phosphorus, arsenic, antimony and bismuth. Similar to the preceding groups, elements of this group as well show regular gradation in the physical and chemical properties. Nitrogen and phosphorus are definitely non-metallic, arsenic and antimony are metalloids, whereas in bismuth metallic features, prevail. The primary element in the group, nitrogen exhibits some of the exceptional behavior. Group 15 of the periodic table includes some of the very significant elements. Nitrogen is the main component of the atmosphere of earth. Both nitrogen and phosphorus are necessary elements of all animal and plant tissues. They are as well place to a variety of uses as elements and in the form of their compounds. Let us examine how these elements take place in nature and how they are extracted from their natural sources. Nitrogen is the richest uncombined element accessible to man. It includes 78.1% of the atmosphere by volume. In spite of its ready availability in the atmosphere, nitrogen is comparatively less abundant (1.9 x 10-3%) in the crustal rocks and soils of earth. Some of the main minerals are saltpetre, KNO3 and Chile saltpetre, NaNO3. Phosphorus is the 11th element in order of plenty in the crustal rocks of the earth, its occurrence being to the extent of around 0.112%. All its acknowledged terrestrial minerals are orthophosphates. The main minerals of the phosphate family are the apatites, Ca5(PO4)3X and the common members are fluorapatite, Ca5(PO4)3F, chlorapatite, Ca5(PO4)3Cl and hydroxyapatite, Ca5(PO4)3OH. Moreover, there are huge deposits of amorphous phosphate rock, phosphorite, Ca3(PO4)2. As we are familiar that both nitrogen and phosphorus take place in all living beings. They are present in the proteins and in the genetic material deoxyribonucleic acid or DNA. Phosphorus as Ca3(PO4)2 is as well present in the bones and teeth. Arsenic, antimony and bismuth are somewhat less rich in the crust of earth, their abundances being 1.8 x 10-4%, 2.0 x 10-5% and 8.0 x 10-8%, correspondingly. They mostly take place as sulphides. Nitrogen is commercially obtained from air. Initially air is cooled to eliminate water vapor and carbon-dioxide and then it is repeatedly compressed to around 2 x 104 kPa and allowed to expand quickly. This causes the temperature to drop and finally, the air liquefies. Fractional distillation of liquid air allows separation of nitrogen, oxygen and the noble gases. Phosphorus is mainly extracted from the phosphate rock via heating it with sand and coke in an electric furnace (figure shown below) at a temperature of around 1800 K. The non-volatile silicon dioxide displaces the more volatile phosphorus pentoxide which is then decreased by coke. Arsenic, antimony and bismuth can be acquired from their sulphide ores. The ore is roasted in air to transform the sulphide to the oxide which is then decreased via heating with coke. The major use of elemental nitrogen is to form an inert atmosphere in the iron and steel industry and in most of the other metallurgical and chemical methods where the presence of air would entail fire, explosion hazards or undesirable oxidation products. It is as well employed in the packaging of processed foods and pharmaceuticals and to pressurize the electric cables, telephone wires and rubber tires and so on. Liquid nitrogen is as well often employed for freezing of foodstuffs, freeze grinding of normally soft and rubbery materials such as meat, preservation of biological specimens and for in-transit refrigeration. Red phosphorus is employed in matches, fire-works and as a component of the phosphor-bronze alloys employed for making the bearings. The major use of elemental arsenic; antimony and bismuth is in the production of different alloys. Besides the utilization of elemental nitrogen, compounds of nitrogen encompass widespread applications in different fields. Ammonia is employed in different forms as a fertilizer, example as NH4NO3, (NH4)2SO4, (NH4)2HPO4 and so on. Its applications as well comprise refrigeration, as a pH controller in food and beverage industry, pharmaceuticals and in water purification. Nitric acid is the other significant compound of nitrogen. Its main uses comprise manufacture of NH4NO3, explosives such as nitroglycerine, nitrocellulose and TNT. Hydrazine, N2H4 and its methyl derivatives, McNHNH2 and Me2NNH2, are employed as rocket fuels. Nitrous oxide, N2O, is employed as an anesthetic. The sulphides of phosphorus, P4S3 and P4S10 are mainly used in the match industry. Phosphoric acid is employed in fertilizers, rust proofing, cleaning of metals, pharmaceuticals and so on. Disodium hydrogen phosphate, Na2HPO4, is broadly employed as an emulsifier in the manufacture of pasteurized cheese. Sodium dihydrogen phosphate, NaH2PO4, is employed as a constituent in the undercoat for metal paints. Calcium phosphates are employed in baking powders and tooth-pastes. Synthetic Ca5(PO4)3OH (1-2%) is added to table salt to pass on free flowing properties. Sodium tripolyphosphatc, NaP3O10 is employed in detergents and in softening the water. Phosphorus compounds such as Malathion, parathion and so on are employed as pesticides. Arsenic compounds find out extensive use in agriculture as herbicides for weed and pest control, example, monosodium methyl arsenate, MSMA and disodium methyl arsenate, DSMA. Arsenic acid is employed as a wood preservative. Sodium arsenite is employed for the aquatic weed control. Arsenic oxide, As2O5, is employed to decolorize bottle glass. Antimony compound, antimonial lead, is employed in storage batteries. Compounds of antimony by aluminium, gallium and indium, AlSb, GaSb and InSb, find out applications in infrared devices and in diodes. Elements of this group have ns2np3 electronic configuration in their outermost shell. Though, the electronic configuration of the core differs. In case of nitrogen and phosphorus, it is that of the previous noble gas, while for arsenic and antimony it is noble gas plus d10 and for bismuth it is noble gas plus d10f 14. The elements of this group exhibit a systematic gradation of properties (the table is as shown below). Nitrogen is gaseous in nature and exists as the diatomic molecule N=N. This is because of the reason of very high bond energy of the N=N bond, 946 kJ mol-1, that is almost six times the N-N bond energy, 160 kJ mol-1. On contrary P=P bond is quite weak, its energy of 490 kJ mol is just ~ 2.5 times the P-P bond energy, 209 kJ mol-1. Thus, phosphorus exists as tetra-atomic P4 molecules in the gaseous state. In the solid state, it exists in various allotropic forms. The change from non-metallic to metallic character by increase in the atomic number is well described in this group. The first two elements, nitrogen and phosphorus, are non-metals, arsenic and antimony are metalloids while bismuth is principally metallic in nature. In keeping with this trend, the electronegativity of such elements reduces steadily on moving down the group. The density, melting and boiling points of the elements rise with the increase in atomic number. Atomic radii, as anticipated, increase with increase in the atomic number. As an effect, ionization energies reduce on descending the group. Nitrogen exhibits an exceptionally high ionization energy which is due to its small atomic size. As illustrated above, all the elements of this group encompass five electrons in their valence shell, they show a highest oxidation state of +5 by utilizing all the five electrons in forming bonds. As one goes down the group, the tendency of the pair of 's' electrons to remain inert increases and only 'p' electrons are utilized in bonding, resultant in an oxidation state of +3. The stability of +3 state relative to the +5 state therefore increases on moving down the group. In case of nitrogen, a very broad range of oxidation states exists: -3 in NH3, -2 in N2H4, and -1 in NH2OH, 0 in N2, 1 in N2O, 2 in NO, +3 HNO2, +4 in NO2 and +5 in HNO3. The negative oxidation states of nitrogen arise due to its higher electronegativity (3.05) than that of hydrogen (2.1). As we can notice from the table, the energy needed to produce M5+ is so huge that it is never created. The compounds made up by these elements in +5 oxidation state are therefore predominantly covalent. Though, in case of Sb and Bi, the sum of the first three ionization energies is just low adequate to form M3+ions. However fluorine is the only element that gives an electronegativity difference adequate to permit the formation of ionic bonds. Therefore SbF3 and BiF3 exist as ionic solids. As, it is not simple from energy considerations to gain three electrons to accomplish stable noble gas configuration, the formation of the tri-negative ion is rare. However, nitrogen being the smallest and the most electronegative of all the members of the group, forms trivalent anion by reactive metals which encompass low ionization energies. Therefore, nitrogen forms the ionic nitrides like Li3N, Be3N2, Mg3N2 and Ca3N2. As the electronegativity of the other elements of the group, that is, P, As, Sb and Bi, is low, most of their compounds are covalent in the nature. Nitrogen is not capable to extend its coordination number beyond four; the other elements encompass coordination numbers of five and also six. 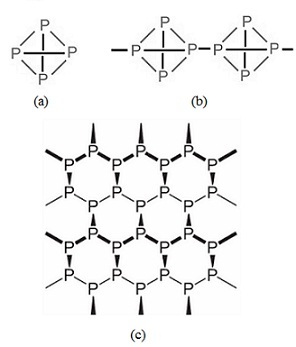 The extension of coordination number is due to the availability of rf-orbitals in P, As, Sb and Bi, using which such elements can acquire sp3d and sp3d2 hybridization, example, in PC15 and PCl6-, correspondingly. Therefore, nitrogen doesn't function as a Lewis acid while phosphorus, arsenic, antimony and bismuth do so. The hydrides of this group and their alkyl derivatives perform as Lewis bases, making a number of addition complexes, example - NH3.BF3, CaCl2.4NH3 and so on. Nitrogen forms strong pπ-pπ multiple bonds however other elements of the group don't exhibit this behavior. This property as well differentiates nitrogen from other elements of the group. Apart from the nitrogen molecule, N=N, compounds having pπ-pπ multiple bonding comprise nitrates, NO3-, nitrites, NO2-, azides, N3-, cyanides, O=N-, oxides of nitrogen and so on. Therefore, the oxides N2O3 and N2O5 are monomeric due to the presence of multiple bonds however analogous P2O3 and P2O5 exist as dimers, P4O6 and P4O10. Though, phosphorus and the heavier elements of the group exhibit dπ-pπ bonding. Phosphorus exists as the discrete tetrahedral P4 molecules in the gaseous and liquid states and as well in the solid state as white phosphorus. Due to angular strain in the P4 molecule in which the angles are just 60°, it is reactive. It spontaneously catches fire in air. White phosphorus is soft, considerably volatile and poisonous, soluble in organic solvents however not in water. However, it is stored under water to protect it from the oxygen. Phosphorus glows in the dark having faint green glow, due to the phosphorescence. Above 1600 K, P4 molecules start to dissociate into P2 molecules. Fast cooling of this vapor gives brown phosphorus that probably contains P2 molecules. If white phosphorus is heated above 1000 K for some time, one of the P-P bonds in P4 is broken and a polymeric form of phosphorus termed as red phosphorus is made. Due to its polymeric structure in which angles are less strained, it is less reactive. 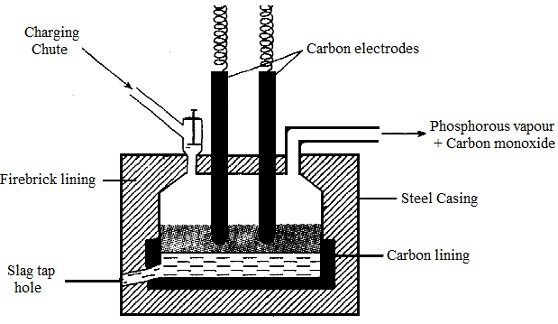 Heating white phosphorus in high pressure yields in black phosphorus which is inert and consists of layer structure (figure shown below), similar to graphite. Similar to graphite it consists of metallic lustre and is a conductor of heat and electricity. Black phosphorus is the most metallic of allotropes of phosphorus and is frequently termed as metallic phosphorus. Reactivity of the different allotropic forms of phosphorus towards other substances decreases in the order, brown > white > red > black, the last one being about inert. Likewise, arsenic, antimony and bismuth as well encompass a number of allotropic forms. Usually, the metallic allotropes become more stable with increasing atomic number. Nitrogen is quite inert at room temperature due to the great strength of the N=N bond, 946 kJ mol-1. This is a blessing, in the sense that our atmospheric oxygen might or else disappear with some of the nitrogen to form oceans of the nitric acid. White phosphorus is extremely reactive whereas red and black allotropes are not. Arsenic, antimony and bismuth are quite reactive. With oxygen, nitrogen combines merely at very high temperatures to yield nitric oxide; white phosphorus joins so readily giving trioxide and pentoxide that it is stored in water. Arsenic, antimony and bismuth on heating in air form the trioxides As2O3, Sb2O3 and Bi2O3, correspondingly. All apart from nitrogen react with halogens to form halides EX3 and EX5; bismuth outcomes only BiX3 (inert pair effect). All react with sulphur, apart from nitrogen, to form the sulphides. Just nitrogen reacts with hydrogen under appropriate conditions to form ammonia. All the elements of group 15 react by metals; nitrogen making nitrides, phosphorus and arsenic giving phosphide and arsenide while antimony and bismuth make alloys. Hot concentrated sulphuric acid transforms phosphorus, arsenic, antimony and bismuth to H3PO4, H3AsO3 (arsenious acid), Sb2(SO4)3 and Bi2(SO4)3, correspondingly. By nitric acid, phosphorus makes phosphoric acid, arsenic forms arsenious and arsenic acids, antimony and bismuth form Sb2O5 and Bi(NO3)3 correspondingly. 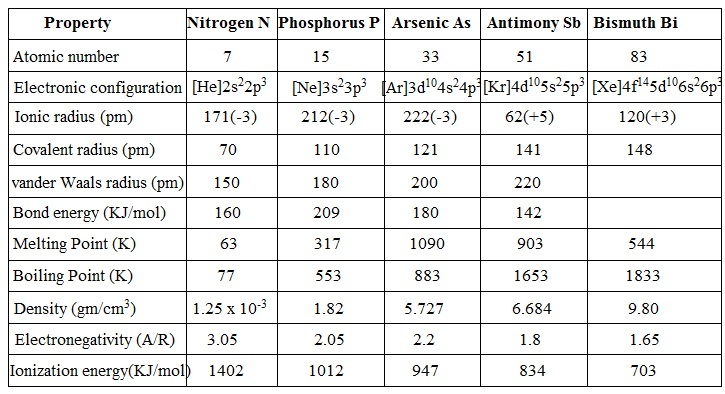 The action of alkalis is different on various elements - phosphorous forms alkali hypo phosphites and phosphine, arsenic alkali Arsenites AsO3-, while antimony and bismuth remain unaffected.